ALTHOUGH the property market is expected to be soft in the coming months, it will be business as usual for the SP Setia group, group chief executive officer and managing director Tan Sri Liew Kee Sin said. He said there were a few new launches in the pipeline in the coming months. “The group is confident of achieving its target of RM180mil in revenue from the sale of its properties in Penang for the fiscal year ending October 2009,” he told StarBiz. “About 50% of the targeted revenue would come from the sale of the Setia Pearl Island properties in Bayan Lepas, comprising the remaining bumiputra units of phase two and the properties of phase three. “The other 50% will be contributed by the sale of the units of Setia Vista, a project comprising 250 terrace houses, to be launched in the second quarter in Relau,” he said. “Our target is to generate RM45mil in revenue for each quarter in 2009 from the sale of properties in Penang (from the Setia Pearl Island and Setia Vista schemes),” he said. The 558 units of Setia Pearl Island’s first and second phases have been sold. The units will be handed over to the purchasers next month. “For the third phase, which comprises 172 units of super-terrace and semi-detached houses, we have launched and fully sold the super-terrace houses. Some 58 semi-detached houses were launched recently for the third phase,” he said. “The remaining 54 semi-detached units will be launched in the third quarter of 2009,” he said. This year, SP Setia plans to develop the RM150mil Reflections, a single block of 350-unit condominium scheme within Setia Pearl Island. “The units, with built-up areas of 1,048 to 1,543 sq ft, will be tentatively priced from RM338,880 onwards,” he said. Meanwhile, according to the group’s independent geo-technical consultant engineer Tang Heap Seng, the RM1.2bil Setia Pearl Island project sits on 112-acre hillside land that consists of about 70% bedrock, which ensures the stability of the land. “Using the two-tier development approach, we are able to maintain the developed terrain at a gradient of around 15 degrees. According to the norm, an existing hill slope with a gradient higher than 36 degrees is a cause for concern,” Tang said. Liew said the two-tier development made it more expensive to develop the infrastructure works and facilities, as it required more entrances and separate internal roads to be constructed. He added that the group’s approach to managing hillside development was thorough. “The strategy used encompasses four stages spanning soil investigation, design, construction and post-construction. “Each stage involves the participation of qualified team members, and is headed and supervised by specialist consultants. “Designs are cross-checked by an independent checker and a second opinion is sought from another independent specialist,” he said. “Until today, we have spent about an additional RM1mil on slope protection, which involves the construction of berm drains, turfing and guniting, which uses cement to reinforce the slope,” Liew said. He said for the project, the group had engaged five geo-technical experts to provide consultation during the construction period. “The group’s technical team, in collaboration with the geotechnical consultants, has been carrying out periodic inspection of the development site since the inception of the project, and will continue to do so after completion. “All the designs and submissions are ultimately vetted and approved by the local authority and technical departments based on stringent guidelines,” he said. ISKANDAR Malaysia will drive the growth of the property market in Johor during the global economic slowdown. Located at the southernmost part of Johor, it spans over 2,217 sq km covering Johor Baru, Senai-Kulai, Gelang Patah-Pontian and Pasir Gudang-Tanjung Langsat. It was the first economic growth corridor launched in the country on Nov 4, 2006 and, as at today, had received RM43bil investments from the RM47bil targeted by 2010. “Iskandar is more viable compared with other economic growth corridors in Malaysia,’’ KGV-Lambert Smith Hampton director Samuel Tan Wee Cheng told StarBiz. The other corridors are the Northern Corridor Economic Region, East Coast Economic Region, Sabah Development Corridor and Sarawak Corridor of Renewable Energy. Tan said that despite criticisms and unfavorable comments from certain quarters on Iskandar since day one, it had been in full swing with the influx of local and foreign investors. He said the investment in Iskandar would not only spill over to other parts of Johor but would also be of national interest as it was being watched closely by other countries in the region. Tan said the Johor property market also benefited from Iskandar as demand for high-end residential properties was on the rise in south Johor. Apart from the Iskandar factor, Tan said Singapore also played an important part in determining the economic growth in Johor. “It is a well-known fact that both Johor and Singapore are intertwined in economic activities during good or bad times due to their close proximity,’’ he said. Tan said thousands of Johoreans and locals from other states who stayed in Johor Baru crossed over to the republic daily to work because of the strong Singapore dollar. He said Johor had been supplying workforce to Singapore for many years and when the two integrated resorts take shape in the next two years, more workers would be needed in the services industry there. Meanwhile, thousands of Singaporeans visit Johor Baru regularly to shop, dine or visit friends and relatives. Some also owned houses in Johor. He said although Singapore had slipped into a recession, the S$35bil economic stimulus package would assist the republic, and it could be the first to be out of the downturn. Real Estate and Housing Developers Association (Rehda) Johor branch chairman Lee Kim Chia also agreed with Tan that Iskandar was the driving factor for the property market in Johor to overcome the downturn. He said the influx of local and foreign investors would create job opportunities within Iskandar and the presence of new residents would bode well for the property market in south Johor. “As we can see now, several projects by the public and private sectors are already taking shape in Iskandar and these will create an economic spillover effect,’’ said Lee. Under the Ninth Malaysia Plan, the Federal Government has allocated RM6.83bil for infrastructure projects in Iskandar. In the past six months, the Iskandar Regional Development Authority has awarded RM1.62bil tenders comprising 18 projects. The projects include seven road packages worth RM1.45bil, seven drainage projects worth RM76.52mil and four river-cleaning jobs worth RM89.6mil. “Everybody knows 2009 will be a tough year because of the uncertainties in the global economy and even the property market is not spared,’’ he said. However, Lee said that even during bad times, there were people who needed houses, thus the need for developers to be innovative and creative in their marketing strategies. He said some of the developers might proceed with new launches; others might defer or scale down their products or even review the pricing. Lee said the last quarter of 2008 was already showing signs of slowing down in the property market following the credit crunch in the US and the financial crisis in Europe. He said developers taking part in the last property expo in Johor in November managed to record RM100mil sales. “The figure is still considered good and Rehda is hoping to record a similar figure for the coming Mapex 2009 to be held either in March or April,’’ said Lee. PROPERTY developers in Johor – like in other parts of the country – are taking different strategies and approaches in view of the softening property market. Developers opined that unlike the 1997-98 Asian financial crisis, it was more challenging now as countries in the world were facing uncertainties from the global economic downturn. However, they said this time around governments globally were taking pro-active steps and making concerted efforts to overcome the situation. SP Setia Bhd group executive director Chang Khim Wah said the company would continue to focus on its ongoing projects in Johor even during bad times. The projects are Bukit Indah I & II, Setia Indah, Setia Tropika and Setia Eco Gardens. “We are not worried about others and what they are doing but instead are looking at how we can improve and provide what is best for our customers,’’ he said. Chang said developers had to be innovative and creative regardless of whether the times were good or bad as today’s consumers were more knowledgeable and expected only the best and product differentiation. He said although the property market might not look rosy this year, it could benefit from the lower interest rate as this would prompt serious house buyers to make purchases. Chang said even during bad times, there were still buyers with cash and who were willing to spend on properties as they knew they would get good deals from developers and banks. He said the company recently launched 40 bungalows with a price tag from RM1.3mil each at its Setia Tropika project in Kempas. “Sales were good and the units were immediately snapped by Chinese and Malay businessmen,’’ said Chang. The company would concentrate on landscaping at all its projects in Johor, he said, adding that it did not see prices of properties in Johor dropping this year. Mah Sing Group Bhd is not going to postpone or scale down its property launches in Johor. In fact the company is confident of recording good sales this year. Its projects are the Sierra Perdana, Sri Pulai Perdana I, Austin Perdana and Sri Pulai Perdana II launched recently. Mah Sing Properties Sdn Bhd chief operating officer Ng Heng Phai said the Johor property market had never been a bubble market and the property price appreciation was more moderate. “Johor is fortunate during this economic downturn as it has Iskandar Malaysia and can benefit from the two integrated resort projects in Singapore,’’ said Ng. He said the commitment shown by the stakeholders to make the economic corridor a success should be lauded. Ng said the two integrated resorts in Singapore would create 10,000 jobs in the services sector and, in this respect, Johor had always been providing the workforce needed by the republic. In Singapore, the hospitality service employees earned between S$1,500 and S$3,000 monthly and they were what the company was looking at as potential house buyers, he said. “The unemployment rate is likely to reach 6% this year but we still have 94% of the population working and this is the segment developers should target instead on harping on the unemployment rate,’’ said Ng. Berinda Properties sales manager Lim Sung Heng said the company would try to adjust its products according to the economic situation. He said, for instance, when times were good, it usually launched 300 units of new houses, but was now looking at 100 units at the most. It was also considering reducing the size of the houses so that the prices were not marked up. Lim said the company still enjoyed good sales and most of its buyers were businessmen in the recession-proof business and multi-level marketing companies. “There are always opportunities during a crisis but we must be able to maintain our costs by streamlining our products or reviewing them,’’ he said. 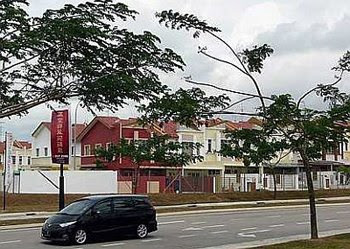 Berinda is a member of the Kuok Group and its projects in Johor are Taman Molek, Taman Impian Emas, Taman Impian Heights, Taman Redang, Taman Ponderosa, and the soon-to-be-launched Ponderosa Woods. It also owns the Impian Emas Golf and Country Club and Ponderosa Golf and Country Club. MACQUARIE-controlled MGPA, a private equity real estate investment advisory company, will use part of its Asia Fund III (AF III) to acquire more properties in Malaysia, its top official says. Chief executive officer for Asia developments Michael Wilkinson said it is looking to buy integrated and stand-alone properties, land, and old buildings that require a complete makeover. MGPA will not allow the state of the current economy to deter its plan to grow and hence, will also buy over real-estate companies, he said. "We are reviewing some opportunities now, but can't comment further until the deals are done. We are looking quite broadly in Malaysia," he said. Wilkinson was speaking to Business Times after a media briefing in Kuala Lumpur recently on the RM1.3 billion redevelopment of The Intermark (previously City Square Centre) and Integra Tower (previously Plaza Ampang Mall). The AF III real-estate fund, which closed last year, has raised US$3.9 billion (RM14.1 billion), resulting in a potential buying power of US$15.6 billion (RM56.5 billion). According to its website, the fund has already committed equity of US$2.2 billion (about RM8 billion) to investments in Singapore, Japan, China and Thailand in the office, retail, residential, hotel and logistics sectors. It has active opportunities under consideration in South Korea, Malaysia, Taiwan and Australia. MGPA's first property acquisition in Malaysia was City Square and Plaza Ampang, acquired in 2007 through AF II, for RM760 million. Wilkinson said MGPA will not sell its Malaysian properties for now. He also did not rule out disposing of the assets if a good offer comes in later and reinvesting the capital. He said if MGPA is faced with the same opportunity to buy assets like City Square and Plaza Ampang in the present economy, it will invest in the deal. "If there's a good location and growth prospects, we will invest tomorrow. It is a good time to be investing, particularly in a strong market like Malaysia. If we are going to endure one to five years of downturn, let it be ... we have quality assets to sustain," he said. Wilkinson said the current situation is a short-term cyclical occurrence and investors should not be distracted by it. "In this climate, there is an expectation that a lot of people will be under pressure and selling good quality assets. We have not seen that happening or experienced the market disintegrating in terms of pricing," he said. "If you feel the financial market will be dislocated forever, then sell your assets. But if you believe its a short-term effect and the market will correct and the government will respond, then in not too long, the situation will improve," he said. Wilkinson believes there will be a similar correction as during the Asian financial crises in 1997 and the severe acute respiratory syndrome outbreak in 2003. Although the present situation may take one or two years to recover, it will not have any impact on MGPA's investment strategy, he added. "Our job is to manage other people's money and that carries with it some very serious obligations. Fortunately for us, we invest in real estate, which fundamentally is about location, supply, demand and long-term economic performance. "We have the ability to create value, which is why we will buy even the ugliest of building, and turn it around," Wilkinson said. From left: K. Soma Sundram, Deputy Finance Minister 11 Datuk Kong Cho Ha and MIEA convention chairman Kelvin Yap at the press conference after the launch of MAREC 2009. KUALA LUMPUR: Malaysian Institute of Estate Agents (MIEA) hopes the Government will review the Valuers, Appraisers and Estate Agents Act 1981 to give more benefits to real estate agents. President K. Soma Sundram said Malaysia remained the only country in the world where valuers and estate agents were regulated under one legislation. He said it was important to separate valuers and estate agents as both had contrasting views about the practice. “The truth is that out of the 17 board members on the Board of Valuers, Appraisers and Estate Agents Malaysia, only two estate agents represent us. “This is a great imbalance,” he said on Saturday at the launch of the Malaysian Real Estate Convention 2009 (MAREC 09). Soma Sundram said that he made a clarion call last year to those concerned that as a long-term plan, they should seriously consider setting up the Estate Agents Board. He said the future of estate agencies should be in the hands of real estate agents and that MIEA proposed the Finance Ministry (the Board of Valuers, Appraisers and Estate Agents Malaysia is under the purview of the ministry) considers the following structure: the Board for Valuers and Appraisers covering those whose principal calling is valuation and the Board for Estate Agents for those whose principal calling is estate agency. The director general of valuation will be president of both boards. “I’m confident that if this proposal is acceptable to all involved, it can become a reality in two to three years,” he said. MIEA was established 32 years ago as an association representing registered estate agents in the country to voice matters relating to their practice. MAREC 09 was held over the weekend with the theme Reinventing the Profession. MIEA also launched its website on Saturday.